﻿Use the following directions to manipulate the applet below. Then fill in the feedback questions at the bottom. GOAL: Given two congruent segments, AB ≅ CD. Using only line reflections, show this congruence. Segments AB (labeled Start) and CD (labeled END) have been drawn and are fixed. Click on the box to see the first line of reflection (line f) and the reflected image of segment AB (labeled SEGMENT 1) Move the line of reflection (line f) so that Segment 1 shares an endpoint with END. You can do this by clicking on either of the blue dots on line f or click on line f and drag. 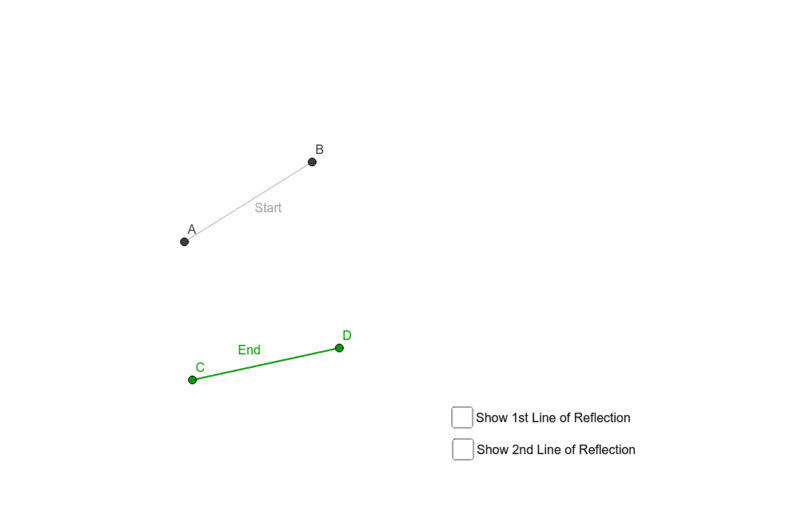 Where do you think the second line of reflection should be drawn so the points you lined up don’t move. Now click the box to see the 2nd line of reflection (called line h). This creates SEGMENT 2, the reflection of SEGMENT 1 across line h. Move line h in the same manner as before until the SEGMENT 2 lines up with END.